In the upcoming BEAUTIFUL AND POINTLESS (Dec 4-6), Theatre Gigante stages five plays by poet Frank O’Hara: Try! Try!, Grace and George, Change Your Bedding!, Lexington Avenue, and Very Rainy Night. 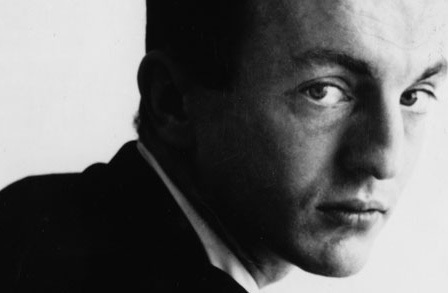 FRANK O’HARA (1926-1966) was a poet, playwright, art critic, and curator in 1950s and 60s New York. In his life and work, he was a creative and social force connecting writers and artists, being close friends with writers John Ashbery, Joe LeSeuer, Amiri Baraka (Leroi Jones) V. R. “Bunny” Lang, Kenneth Koch, and visual artists Grace Hartigan, Alfred Leslie, Alice Neel, Willem de Kooning, Larry Rivers, Jasper Johns, Joan Mitchell — and many many others. O’Hara wrote his friends into his plays and poems, and his friends painted, drew, photographed and wrote about him. In Try! Try!, O’Hara’s fellow poets John Ashbery and Violet Lang played the leads; Grace and George were played by painters Grace Hartigan and George Montgomery. This is Gigante’s third foray into the world of Frank O’Hara. In 2000, Ed Burgess took O’Hara’s Very Rainy Night and wrote a framework around it, adding another character, more dialogue, and including music and movement in his staging. Two years later, director Wes Savick directed three more O’Hara plays for the company, including Lexington Avenue and Change Your Bedding! Gigante is excited to re-visit Ed and Wes’ work, and to add two new scripts, Grace & George, and Try! Try!